*A Hex Hall spin-off series!!!! Fifteen-year-old Izzy Brannick was trained to fight monsters. For centuries, her family has hunted magical creatures. But when Izzy’s older sister vanishes without a trace while on a job, Izzy's mom decides they need to take a break. Izzy and her mom move to a new town, but they soon discover it’s not as normal as it appears. 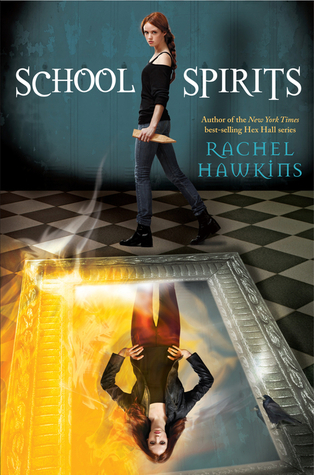 A series of hauntings has been plaguing the local high school, and Izzy is determined to prove her worth and investigate. But assuming the guise of an average teenager is easier said than done. For a tough girl who's always been on her own, it’s strange to suddenly make friends and maybe even have a crush. Can Izzy trust her new friends to help find the secret behind the hauntings before more people get hurt? I can't wait for this either!! I actually don't know how I'll go reading books without Archer to swoon over, but I'm willing to give it a go!! I was mad at what happens in the last Hex Hall book so I never read it but I'll probably give this new series a try. My pick as well! It will be interesting to see where she takes this series. I loved Hex Hall so much! I still have to read the rest of the series, but I can't wait for this one either! Nice! I still need to finish the trilogy but am excited to hear there's a spinoff already! Now if I just finish the books I can see what this one will be about! Definitely. I loved the series this spins off from and now there's a new gal in town! I love spin-offs. Still waiting to see if NG approves me or not. AHH! I still need to finish the last book of the other series. I'm so behind! I still haven't read any books from this author, but everybody loves them so I really ought to. Thanks for sharing and I'll put Hawkins's books at the top of my TBR pile. Is this a completely new series? Or, a spin-off or what? I haven't even read the Hex Hall series, but I can see the similarity between the covers. I love the Hex Hall series so I can't wait to check out the spin-off. Thanks for sharing! What? A spin-off series? Oh my, I have some reading to catch up on! I am so thrilled that this spinoff is happening. I love Hawkins' writing and am looking forward to spending more time in that world. I can't wait to read Hex Hall and this series looks amazing as well! Barnes & Noble Closing 200 Stores!